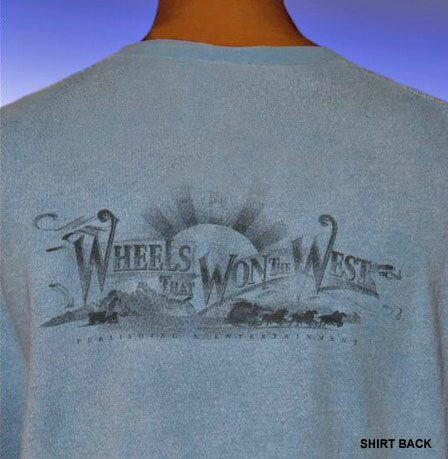 Designed with an original Concord Coach illustration from the legendary works of Abbot-Downing, this Wheels That Won The West® short sleeve tee is the ideal complement to your love for the Old West. 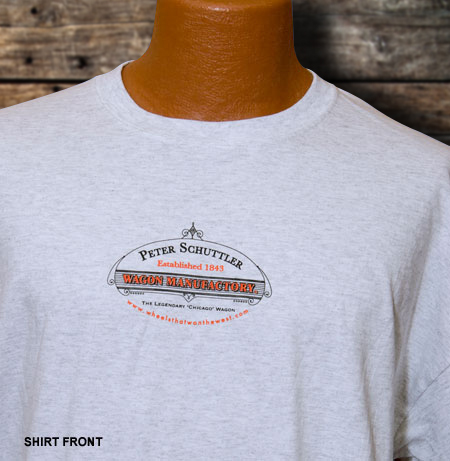 Enjoy the smooth, relaxed comfort of 6.1 oz, pre-shrunk 100% cotton. The stylish, stonewash green tones are contrasted with full front, custom graphics in black and green. $25 plus U.S. s/h. Available in Small, Medium, Large, XL, and 2XL. Select the size of your choice in the drop down menu below and click BUY NOW with PayPal. Fully complimenting your western lifestyle, this go-anywhere custom tee is highlighted by nineteenth century artwork originally produced for legendary coach builder, Abbot-Downing. 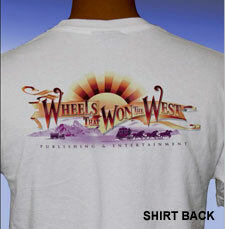 It’s an original, Wheels That Won The West® design fashioned on the stylish comfort of 6.1 oz, pre-shrunk 100% cotton. The classic white, short sleeve tee includes a full front graphic in black and green. Select the item of your choice in the drop down menu below and click BUY NOW with PayPal. 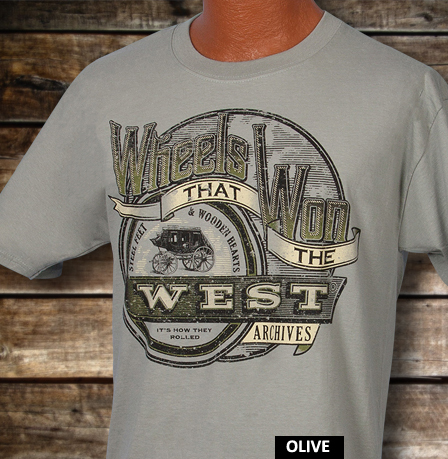 Celebrate the wheels that built the American West with this classic, short sleeve design. The charcoal color features a full front graphic in tan and black. It’s a look and feel you’ll appreciate as the cool comfort of this 5.5 oz pre-shrunk cotton tee is always in style and ready to go when you are. Celebrate the rugged spirit of the Old West with this exclusive tribute to one of America's most legendary early western vehicle makers. The successful rise of Peter Schuttler and his farm, freight, ranch and business wagons during the 19th century is a remarkable story of extraordinary triumph in the face of almost certain defeat. Attesting to the long-term value of premium quality work, today well-preserved examples of these genuine 'Chicago Wagons' are still among the most highly regarded and sought after western horse drawn vehicle brands. XL available in Heather-gray only. Click BUY NOW below. 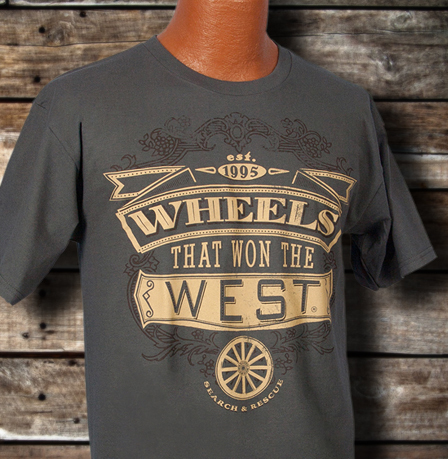 Share your passion for the legendary vehicles of the Old West with this custom designed Wheels That Won The West® tee. The relaxed look and comfortable feel of this 100% cotton shirt will make it an instant favorite. Emblazoned with our original Wheels That Won The West® graphics, it’s available in a choice of Watermelon Red and Dusty Blue colors**. The pre-shrunk designs are offered in 2X, XL, L, and M sizes. $22.50 plus U.S. s/h. 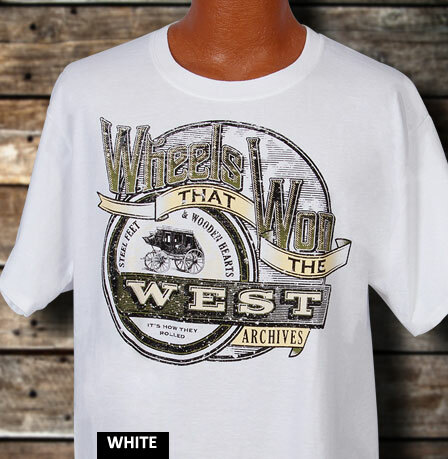 **A limited number of white Wheels That Won The West® tees are also available. 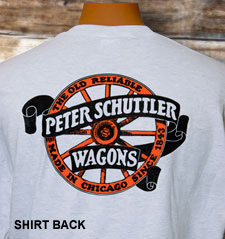 These are the same shirts seen at the National Championship Chuckwagon Races. Email us at info@wheelsthatwonthewest.com for more details. 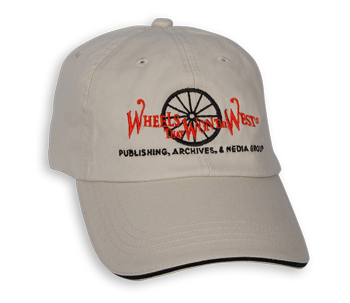 Our Wheels That Won The West® khaki cap is embroidered on the front in paprika and black. It’s made from ultra-comfortable cotton twill fabric and features a low profile, unstructured design that’s ideal for worry-free travel. The contrasting trim color on the bill is matched with a striped accent on the adjustable size closure in the back. $25 plus U.S. s/h. One size fits most. BUY ONLINE! Click BUY NOW below.